Acrylic Riser gives product prominence and creates a more organized and attractive display of small and featured merchandise. 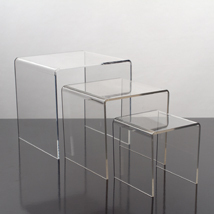 The Risers can be used in showcases, on countertops or in window displays. Use a variety of risers for a display that is endless.